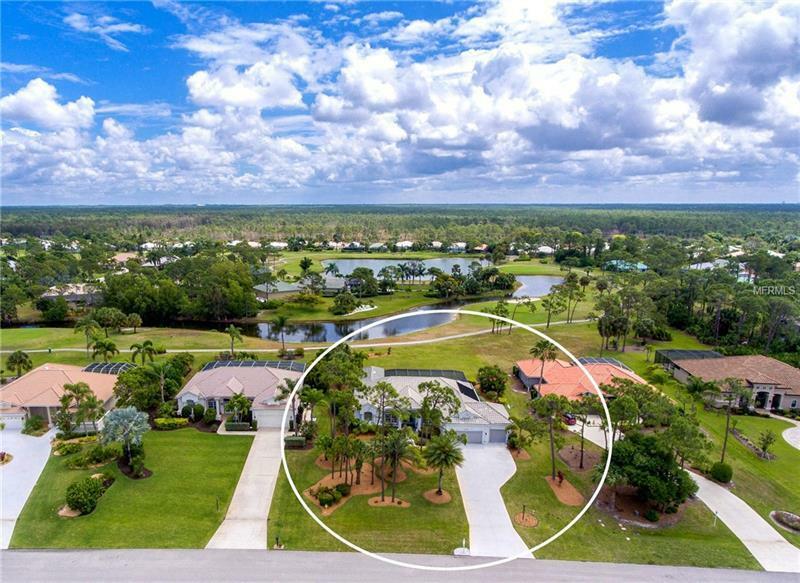 This stately custom home is situated on a spacious half acre fee simple lot overlooking the golf course in the gated community of Burnt Store Marina! You are sure to be impressed by the curb appeal as well as what you discover inside! Enter through double French doors with decorative glass insets into the spacious living room with volume ceilings. You are sure to be drawn out to the spectacular outdoor living space through the disappearing sliding doors to enjoy the lanai & pool area! The handsome paver pool deck has been expanded to include two large under-cover areas overlooking the refreshing free-form pool, scenic pond and golf course. Inside, the stunning updated kitchen boasts rich wood cabinetry, granite tops, tile backsplash with decorative insets, stainless steel appliances, under cabinet lighting, island & breakfast bar. The expansive dining nook can accommodate a large gathering & enjoys views of the pool & golf course through the bay windows. A cheerful front room can also be used for formal dining or sitting room. The inviting master retreat overlooks the pool with direct access to the lanai, and offers staggered neutral tile in the bath, dual sinks, walk-in shower, jetted tub and a walk-in closet. The guest wing features two spacious bedrooms, bathroom with Roman shower and direct access to the pool. French doors lead to the office/fourth bedroom which can be great for overflow guests. An oversized three car garage completes the package with ample room for all of your recreational toys! Pet Restrictions: See HOA docs for pet restrictions.